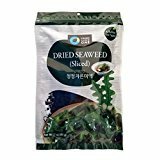 Chung-Jung-One Miyeok is pre-cut seaweed (also called sea mustard or wakeme in Japanese) that is carefully chosen and produced in South Sea, Korea. The South Sea in Korea (Namhae-An) is known for being a clean sea, growing various sea plants and seafood. Chung-Jung-One claims that seaweed is processed sanitary at the latest facility. The package looks small because the miyeok is dried, but it expands 10 times when soaked in water. Soak in cold water for at least 5 minutes and wash 2-3 times.Great for making seaweed soup, seaweed salad and other seaweed dishes.